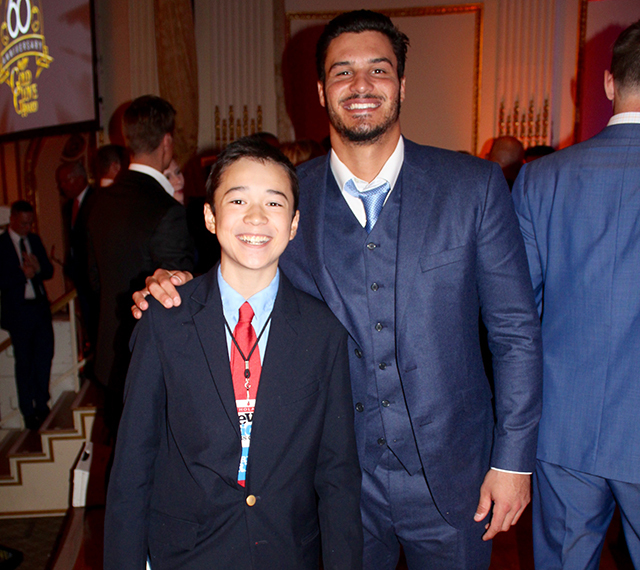 Honoring the Best in the Field | Kid Reporters' Notebook | Scholastic Inc.
Maxwell with Nolan Arenado, who plays third base for the Colorado Rockies. At the ceremony, Arenado received a Platinum Glove for his top defensive play in the National League. The 60th annual Rawlings Gold Glove Awards ceremony took place on November 10 at the Plaza Hotel in New York City. “It is the gold standard that all defensive play is measured by,” said Rawlings executive vice president Mike Thompson. The event honors the “Finest in the Field” in Major League Baseball (MLB), with managers and coaches casting ballots for the best defensive players of the year. A statistical component also goes into the selection process. Awards were presented to 18 players­, one for each defensive position in MLB’s two leagues, the American and the National. Two players also took home Platinum Gloves as top defensive players in their respective leagues. Byron Buxton, center fielder for the Minnesota Twins, won in the American League, and Nolan Arenado, third baseman for the Colorado Rockies, won in the National League. Derek Jeter, a retired New York Yankees shortstop, received the “Heart of Gold” Award for his contributions off the field. In 1996, Jeter founded the Turn 2 Foundation to motivate kids to stay away from drugs and alcohol. Joe Torre (former manager of the New York Yankees): First off, dedication. You can never look at the clock to see how long you’ve been out there. You just have to stay out there until you get the job done. Don Mattingly (manager of the Miami Marlins): Number one, it takes . . . talent,­ a guy who can really run and can throw. A lot of that is natural, but then I think that your upbringing and how you are raised, and how your beliefs are formed, can really take a guy to the next level. Cheri Kempf (NPF commissioner): To be coachable. That’s the biggest thing that makes the difference between good and great. Eric Hosmer (first baseman for the Kansas City Royals): Never look away from your dreams. Tucker Barnhart (catcher for the Cincinnati Reds): Work really hard. It’s a long, hard road, but it’s something that is extremely fun and rewarding. Brandon Crawford (shortstop for the San Francisco Giants): My dad always stayed on top of me to work hard in school, and that eventually got me to UCLA. I was able to continue playing baseball there, and that got me to be able to play professional baseball. He always made sure that I took extra batting practice, extra ground balls, stuff like that.